Yamaha Motor Canada, introduces the all-new 2018 Kodiak 450, the highest value mid-class 4×4 ATV that provides the best off-road capability, comfort and confidence for all-day riding. The all-new Kodiak 450 joins the best-selling Kodiak 700 and recreation-pointed Grizzly 4×4 ATVs to offer a wide array of possibilities and options for off-road enthusiasts, outdoorsmen and women, farmers and ranchers alike. The new Kodiak 450 combines Yamaha’s legendary durability and reliability with class-leading handling and is powered by a 421cc Yamaha fuel-injected engine for Proven Off-Road performance. 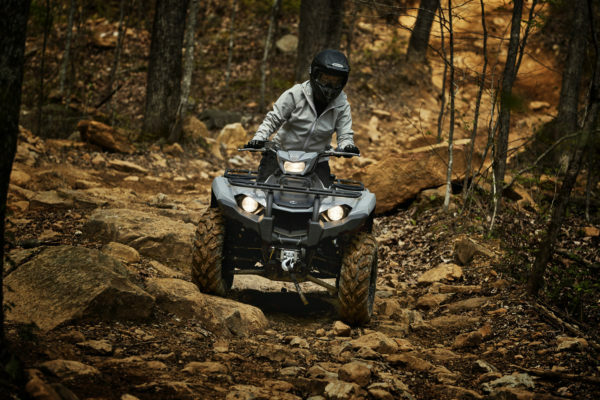 Its all-new chassis features a compact-footprint that mid-size ATV customers will appreciate, along with an extremely roomy riding position to comfortably accommodate even larger riders. “This year we aimed to bridge the gap between the entry-level rider seeking comfort and confidence, and the experienced rider looking for increased capability. The all-new Kodiak 450 was the ideal fit and allowed Yamaha to expand back into the mid-sized ATV market while continuing to offer customers renowned quality and reliability.” said Peter Smallman-Tew, Vice President of Sales and Marketing, Yamaha Motor Canada. Boasting Yamaha-exclusive REAL WORLD Tech, the all-new Kodiak 450 is the ideal mid-size multipurpose ATV, ready for work and trail-exploring adventures. Delivering a Proven Off-Road level of capability, comfort and confidence only available from Yamaha, REAL WORLD Tech features on the Kodiak 450 include: Ultramatic® automatic transmission with high, low, reverse and neutral, providing the industry’s most durable CVT transmission and natural-feeling engine braking throughout the RPM range, On-Command® 2WD/4WD system, Electric Power Steering (EPS), adjustable dual A-arm suspension and more. Developed with ideal accessory integration in mind, the Kodiak 450 is designed for easy installation of genuine Yamaha accessories, including a new highly-integrated winch and mounting plate kit – with wiring already pre-installed by the factory on the Kodiak 450, custom over fenders, gun boot mounts, rack extensions, cooler carriers and more. Kodiak 450 EPS colour options include the new Bluish Grey, Beige with Camouflage, Steel Blue and Green. In addition to Green, the non-EPS Kodiak 450 comes in Red and Steel Blue, with pricing starting at only $7,799 MSRP.